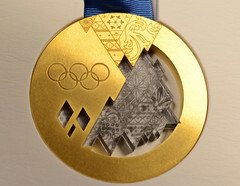 An Olympic gold medal is already a difficult, rare item to attain. And next year, winter Olympians will have an opportunity to win a gold medal that's even more rare. Come February, the seven finalists standing on the tallest part of the podium in Sochi, Russia will be awarded medals made of gold and metal from outer space. Earlier this year, a meteor the size of a bus slammed into the Russian city of Chelyabinsk with the force of 20 atom bombs, generating much spectacular dashcam footage on YouTube. Fragments of that meteorite have been harvested and will be machined into the medals themselves, creating a gold and chondrite disc that only a handful of people on the Earth will ever wear around their necks. "We will hand out [the special] medals to all the athletes who will win gold on that day," said Chelyabinsk Region Culture Minister Alexei Betekhtin, "because both the meteorite strike and the Olympic Games are the global events." Chelyabinsk and Sochi are not geographically close; the chondrite-infused medals will travel some 2,700 kilometers from the first city to the second. But the original meteor, of course, traveled quite a bit further than that. A GUIDE BOOK OF CIVIL WAR TOKENS! The long-awaited new reference by Q. David Bowers: 448 pages of research dripping with American history. More than 2,000 full-color images. Detailed narrative. Valuations. Rarity ratings. Die illustrations, and more. Available next month; pre-order your copy today at Whitman.com (or call 800-546-2995). $24.95.